"Al Pastor is a really popular way to prepare pork, famous in San Francisco's Mission District. It's a marinated roast pork. They make the most incredible tacos and burritos. This is inspired by those flavors." Place dried guajillo and pasilla chiles into a bowl and pour in boiling water to cover. Let chiles stand 30 minutes to soften. Cut pork tenderloins in half crosswise and in half again lengthwise again to make 8 long strips. Drain water from chiles and pour in pineapple juice and vinegar. Add garlic cloves, chipotle pepper, cinnamon, cayenne pepper, cumin, and oregano. Transfer chile mixture to a blender and blend to make a smooth marinade. Place pork into a resealable plastic bag and pour marinade over pork; knead bag several times to coat pork. Squeeze out excess air and seal the bag. Refrigerate overnight. Preheat outdoor grill (preferably charcoal) for high heat and lightly oil the grate. Remove pork from bag and drain and discard marinade; transfer pork to a platter. Drizzle meat with 1 tablespoon vegetable oil and season with salt. Use tongs to gently stir pork pieces to coat lightly with oil. Cook pork strips on preheated grill until meat shows good grill marks and is lightly pink in the center, 7 to 8 minutes per side. An instant-read meat thermometer inserted into the center of the largest piece should read at least 145 degrees F (65 degrees C). Transfer pork to a fresh platter. Drizzle a nonstick skillet with 1 teaspoon vegetable oil and place over medium heat. Lay a tortilla into the hot oil and place 1 slice of Monterey Jack cheese into center of the tortilla. Cook until tortilla is hot, lightly browned on the bottom, and cheese has melted, 1 to 2 minutes. Repeat with remaining tortillas and cheese slices. Transfer each tortilla to a plate. Slice pork strips across the grain into pieces about 1/4 inch thick. Divide shredded cabbage onto each tortilla and top each with about 6 slices of pork, 1 tablespoon roasted tomato salsa, and a few slices of jalapeno pepper. Fold taco over fillings to eat. 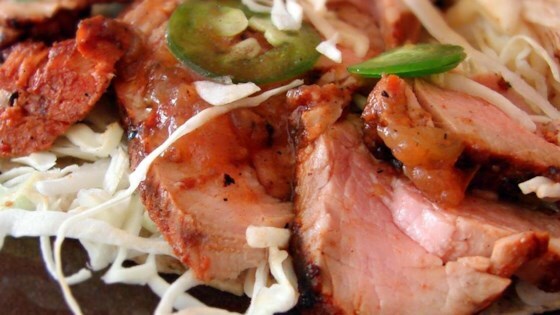 Pineapple juice, chiles, and spices make a terrific marinade for grilled pork. If you can't get the dried chile peppers, you can use dried ground chiles. Just be sure to use one with a name, such as ancho, instead of using generic chili powder. Stop putting shredded lettuce on tacos. Use shredded cabbage. It's so much better for you, crunchier, and just as easy and cheap. Didn't have chile peppers, so used some fresh jalapenos, and cooked it in a cast iron skillet on the stove with some chunks of pineapple. Great recipe! Delicious marinade and as always, a great video! Thanks chef! Made it per receipe for company and we all loved it!!! Used cabbage and the extra crunch was great!!! Flavors are wonderful, worth tracking down the chilies for the marinade!!! Didn't make any changes and it came out perfect. It is now one of my go to favorites!